No need to purchase a short-lived device to get maximum protection for your critical equipment. The robust TSG handles high surge energies, and the True L-C filter and Transient Discriminating Technology stages reduce let-through voltages, providing both features at an affordable price. Surges and voltage transients are a major cause of expensive electronic equipment failure and business disruption. Damage may result in the loss of capital outlays, such as computers and communications equipment, as well as consequential loss of revenue and profits due to unscheduled system downtime. The Compact 63 Amp series of Surge Reduction Filters — a CRITEC part within the ERITECH line of Facility Electrical Protection products — offers an economic alternative to the premium TSG-SRF Surge Reduction Filter series. They utilize the same Triggered Spark Gaps to provide high-energy primary surge diversion, but include a more compact filter section. The secondary surge diversion elements are based on the well-received modular technology of the TDS150 that allows individual modules to be easily replaced in the field, if required. 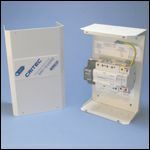 Optionally, they are available without the enclosure for direct mounting within an existing electrical panel. The Compact 63 Amp series of Surge Reduction Filters find their application where the benefits of the TSG-SRF filters are required, but economic considerations dictate a different solution. The simple construction provides for easy field service. 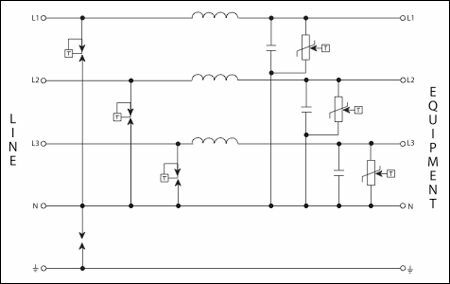 Receive maximum protection of critical electronic equipment and reduce let-through voltages and rate-of-voltage rise (dv/dt).